I remember seeing these William-Sanoma cookie cutters in a catalogue, and kind of laughed, but then saw them to today in person at Williams-Sanoma in the flesh. Not only did I see these cookie cutters, where one could make there own Storm Trooper sugar cookies...I also so a grown man, with a Star Wars cookie cutter set tucked under his arm. Now, who can truly judge the situation, but I do not think he was getting this for his kids...he didn't look like the type of guy who had kids. In fact, he didn't look like the type of guy who had been to the cookware store before...but he did look like he'd seen Star Wars many, many, many times. You know the type. Now, Darth Vadar is frostered very nicely, but can you imagine what the majority of these cookies look like after being frosted by "Comic-Con" types...the detail, even in the Darth Vadar frosting work in the cookies, is challenging enough, not to mention the work you see pictured for Boba Fett. Now granted, some of these cookies might turn out nice, but I'm picturing a neon green smiley faces, black ghost with white sunglasses, white ghost with black eyes and goatees, and a whole bunch of people who skip Boba Fett all together. You may have laughed when you saw these... I rolled my eyes. I don't know what Williams-Sonoma was thinking. But I guess as your experience shows, people are buying them. I don't think I'd buy these. But that doesn't stop them from being freaking awesome !!!1! 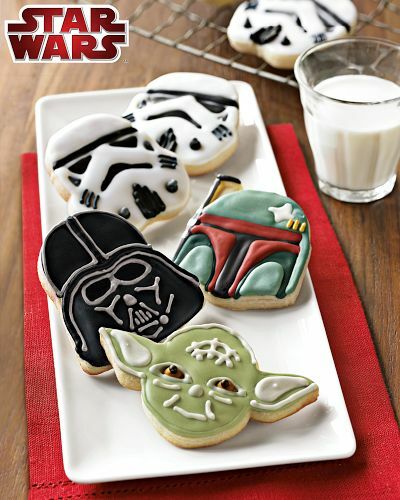 @ Loren - you have to get them and send some pictures of how your yoda cookies turned out :-) Show me your "Jedi Frosting Skills"
I agree with @Anthony...Star Wars doesn't really seem the thing that gourmet cook stores are made of. Those cookies look so good with that milk! Delicious blog!